I don’t normally go for vegetarian meat products. Most of these fake meats aren’t very good, and I have actually never felt like I needed any sort of replacement for the meat that is missing from my diet. A simple pasta with marinara or vegetarian soup is a complete meal in my book. However, I have always enjoyed Field Roast, a popular vegetarian meat substitute that is made locally here in Seattle, for a couple of reasons. For one thing, although the products are often formed into sausage and other meat-like shapes, Field Roast isn’t trying to replicate the taste and texture of meat. It is very much its own thing with its own unique flavor. The other reason that I like Field Roast is because it is produced in one of my favorite Seattle neighborhoods: Georgetown. Field Roast is a common sight on the menus of many Georgetown pubs. I can’t get enough of the Field Roast Reuben at Smartypants or Georgetown Liquor Company’s “Picard,” a Field Roast sandwich on a ciabatta roll served with vegan au jus sauce for dipping! Field Roast Grain Meat Company was founded by Seattle chef David Lee in 1997. Wanting to create a flavorful, protein-rich alternative to meat, Lee looked to a product first developed in seventh century China: seitan. According to legend, seitan was first created by vegetarian Buddhist monks. It is made by kneading wheat flour dough in water until all of the starch dissolves; the stretchy gluten that is left behind is seitan, and it can be used in a myriad of ways (if you have ever had the mock duck at a vegetarian Chinese restaurant, then you have eaten seitan.) Instead of focusing on Asian seasonings, chef Lee flavored his seitan with the European ingredients commonly used in charcuterie. The end result was a unique product that he called Field Roast. Field Roast flavors include Lentil-Sage, Wild Mushroom and Smoked Tomato. It is available in a wide variety of products including sausage links, deli slices, breaded cutlets and the Celebration Loaf: savory field roast stuffed with butternut squash, apples and mushrooms. Vegetarians – do yourself a favor, skip the tofurky this year and treat yourself to a Celebration Loaf instead! The Stranger, Seattle’s offbeat free weekly, recently did a piece on Field Roast. The author of the article proclaimed Field Roast’s Mexican Chipotle Sausages to be the best of the bunch so I picked up a package at my local co-op last week. I crumbled up two of the links and scrambled them with onions and eggs to use as a filling for breakfast burritos. Robert, a true breakfast burrito aficionado, went crazy for it. He even described the Field Roast as “meaty.” The Mexican Chipotle Field Roast makes a great substitute for chorizo. Like chorizo, it is heavily seasoned with garlic and spices. Make no mistake, it is plenty spicy – I topped my breakfast burritos with red chili but it ended up being completely superfluous. Field Roast’s Mexican Chipotle Sausage would be great anywhere that chorizo is used – empanadas, enchiladas, huevos rancheros, etc. You could even use it to make a spicy “chorizo” pizza. Last night, we stir-fried the rest of our Field Roast and stuffed it into crispy taco shells alongside some fideos for an easy, delicious dinner. Last Saturday, Robert and I hiked through the fog and snow up to Silver Peak in the Snoqualmie Pass area. 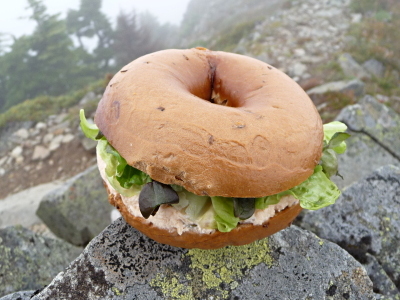 I brought along a pretty standard hiking lunch: bagel sandwiches. Because they are sturdy and densely packed with calories, bagels are great for hiking or backpacking. Other than that, though, I rarely eat them. I think I just wasn’t born with a bagel mindset or something. Whenever I buy bagels, I feel like some sort of bagel poser. There are bagel enthusiasts out there that have extremely strong opinions about their bagels, and I’m sure I have probably made the mistake more than once of buying bagels that they would deem totally worthless. In fact, aren’t any bagels outside of New York City supposed to be worthless? Certainly nobody on the west coast knows how to make a proper bagel, right? New York has that special water or something that makes their bagels superior. When I was a little kid, we used to get bagels from a place called Bagel Boys of New York (long since closed.) Although it has New York in the name, this was a west coast joint. I remember their bagels being really good. I loved helping my mom choose which flavors to include in her baker’s dozen. My favorite was the salt bagel (not too surprising considering that I was also the child who was jealous of my rabbit for having its own salt lick – fortunately, my salt addiction has faded as an adult, although I’ll still take savory over sweet any day of the week.) Sometime in the late 1980′s / early 1990′s, bagels became really popular, and bagel shops started popping up everywhere. The only problem was that these bagels were doughy and soft, and they came in novelty flavors like blueberry and chocolate. I’m no bagel expert but I do know that a good bagel is supposed to be dense and chewy with a browned, slightly crisp exterior. Not soft like a dinner roll! And, I’m sorry, but chocolate is not an acceptable flavor for a bagel. These days, when I need a bagel, I head up to Bagel Deli on 15th Ave. It is only a few blocks from my apartment, and their bagels are actually pretty good. I think so anyway; I’m sure for the bagel freaks out there, they are just as controversial as any other west coast bagel. They are very dense and have a nice, shiny outer shell. I like pumpernickel the best followed by sesame, everything, and my nostalgic favorite, salt. I topped Saturday’s bagel sandwiches with lettuce and a salmon, shallot and caper salad. They were yummy, if a bit dry (they were, after all, a day old by the time we went hiking.) As an added bonus, I’m fairly certain the act of chewing though these super-dense bagels helped keep us warm on top of the snowy mountain. Do you have a favorite bagel spot in town? Move over gelato, ice cream is back! There is a huge ice cream renaissance happening in Seattle right now. People have been raving about Molly Moon’s in Wallingford ever since it opened in May. With such unusual and tempting flavors as Balsamic Strawberry, Cardamom and Salted Caramel, it’s no wonder why. Full Tilt Ice Cream, which just opened for business a couple of weeks ago, is definitely on my to do list. How can you go wrong with pinball, ice cream and Mexican popsicles? I don’t even know what a Mexican popsicle is but I know that I must have this summer. My only problem with Full Tilt is, how on earth do they expect me to choose between Mango Chili and Blackberry Cinnamon? I guess I’ll just have to order a scoop of each! Robert and I are lucky enough to have our very own neighborhood source of ice cream awesomeness: Half Pint Ice Cream. The gal that runs the show is sweet as can be. She comes up with some great flavors and makes every attempt to incorporate sustainable and local ingredients into her ice cream. Although, Half Pint doesn’t have a permanent location in the hood, you can find her selling ice cream at the Capitol Hill Farmer’s Market every Sunday morning (she is also at the Lake City Farmer’s Market on Thursdays from 3 – 7 pm.) Get there early because this ice cream goes quickly. Four different flavors of ice cream are offered each week. Classics such as Rocky Road and Mocha Almond (featuring coffee beans from Victrola) are offset by slightly more unusual offerings like Chai Vanilla and Mexican Chili Chocolate. I really lucked out on opening day of the farmer’s market. Toasted Coconut, one of my all-time favorite ice cream flavors, was on tap that week. I took a pint home and savored its creamy coconut goodness over the following days (okay, it might have taken me more like a day and a half to polish it off.) This week, although tempted by another personal favorite – Pistachio – I ended up being won over by the Lemon Basil Sorbet. As was everyone else it turns out. Each person in line with me, after tasting a sample of the sorbet, immediately proceeded to order a scoop or two. Not for the faint of heart, this sorbet has a very intense, tart lemon flavor. Every once once a while you even come across a delicious little piece of lemon zest to chew on. 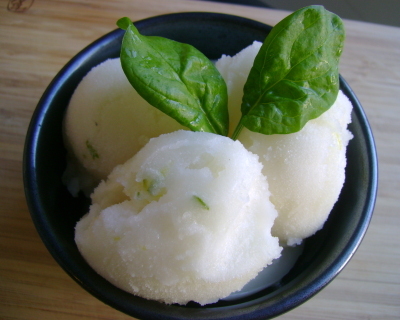 The basil flavor, while not overly pronounced, adds a nice refreshing quality to the sorbet. Yum! I might need to make it my goal to become an ice cream connoisseur this summer. Last year, I joined Boistfort Valley Farm’s CSA program, and I enjoyed it so much that I decided to get a CSA share again this year. With much hesitation, however, I opted to sign up with a different farm this time around. This decision had absolutely nothing to do with the quality of produce and service at Boistfort Valley Farm. They were wonderful, and I highly recommend them. Their produce was all beautiful, there was lots of variety in each box and the farmers were sweet as pie. They really opened my eyes to how great a CSA can be. The problem was that there was simply too much produce in each box for me to keep up with. Their boxes are designed to feed a family of four. Since I was cooking for just the two of us, I found it impossible to use everything up each week, and I would inevitably end up throwing some of it out (and feeling completely guilty about doing so.) Plus, there was always so much produce in the house that I was never able to justify visiting our farmer’s market, something that I really love to do. This year, because they offer a half-size share in addition to their regular shares, I decided to join Whistling Train Farm’s CSA program. Whistling Train Farm is located near Kent, Washington, a mere 20 miles or so outside of Seattle. On top of having a CSA program and a produce stand at several Seattle area farmer’s markets, Whistling Train Farm also supplies fresh produce to some a Seattle’s most popular restaurants including Flying Fish and Brasa. They even gained some notoriety a few years back as a result of famous Seattle chef Tamara Murphy’s “Life of a Pig” dinner. Feeling the need to have a deeper understanding of where the food she was cooking actually comes from, Ms. Murphy spent eight weeks closely following a litter of piglets at Whistling Train Farm, from birth through maturity and, ultimately, to the slaughterhouse and into her kitchen at Brasa where she featured them in a multi-course feast. She chronicled the entire journey here on her blog. Whistling Train Farm operates their CSA slightly differently than Boistfort Valley Farm. As I mentioned, they offer both half-size shares and full-size shares. Whereas Boistfort Valley Farm’s shares consisted of a mix of fruits, vegetables and flowers, Whistling Train Farm offers separate shares for vegetables and fruits. That way, you can pick and choose what you want. I opted to do a half share of vegetables only. I like fruit, but I think I’d rather choose my own at the farmer’s market each week. In addition to the weekly produce shares, you have the option of buying one of Whistling Train Farm’s “egg punch cards” which are good for 10-dozen eggs. I think they sometimes have some meats available for purchase as well, but I’m not sure exactly how that works. The CSA application form also mentioned something about U-pick vegetables for members, which is something I might need to ask about later in the season. Yesterday, I picked up my first box of the new season! As you can see from the photo, I got lots and lots of green stuff. Thanks to the persistently cold weather we’ve been having this year, the spring greens are really hanging around. I have a feeling it will be a while before we see any green beans or zucchini (and who knows when tomatoes will show up?) 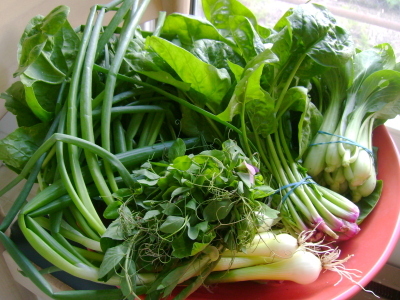 This first box of the season contained two big & beautiful bunches of spinach, a small bundle of pea shoots, baby bok choy, scallions and a bag of mixed spring greens. A nice, reasonable amount of vegetables for two people (and it was so much easier to carry home than the full shares I was getting last year – I practically carried it home with one hand!) As I expected, everything in the box was very fresh and very pretty. I quickly whipped up a meal of farfalle pasta with green lentils and spinach with a side salad of Whistling Train Farm’s spring mix before heading off to my knitting group meet-up last night. Tonight, I made a delicious stir-fry of pea shoots, bok choy and scallions and served it alongside salmon burgers. Yum! The 2008 CSA season is off to a great start! A couple of posts ago, I mentioned how tiny our Broadway farmer’s market was compared to the more established markets around town such those in Ballard and West Seattle. Well, I am happy to report that things seem to have picked up a bit this year. There are still only a handful of farm stands selling fresh produce, but I know for a fact there is at least one that wasn’t around last year. Although the offerings are kind of slim at this point, it is still very early in the season. I’m sure the produce will become much more abundant over the next few months. 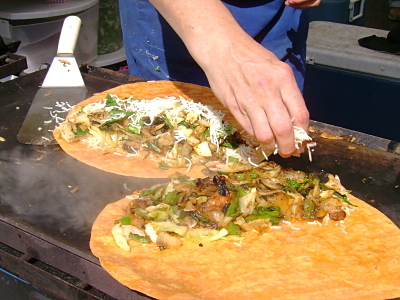 In addition to the farm stands, there are more prepared food vendors this time around which helps give this year’s market a much livelier spirit. The recent sunshine is no doubt helping out in that regard as well. Many of my memories from last year’s market involve farmers huddling under their tarps trying to stay dry while the few patrons brave enough to face the rain ran around trying to do their shopping as quickly as possible. Give us a sunny day here in Seattle and people will gladly spend all morning wandering around the farmer’s market. Although the variety of produce is much more modest this early in the season, I still managed to find a number of interesting things; things I probably never would have paid much attention to if it wasn’t for my brand new cookbook: Local Flavors: Cooking and Eating from America’s Farmers’ Markets by Deborah Madison. This was actually part of our annual staff gift at work along with a reusable shopping bag (can you tell I work for an environmental company?) This is a perfect gift for me as I am a longtime fan of Deborah Madison. Her early cookbooks, The Savory Way and The Greens Cookbook, are classics in my family and, although I’m only part of the way through it, I wouldn’t be surprised if this new book also makes the list of favorites. Not only is it a fantastic collection of recipes, Local Flavors is also a really great reference guide for some of the less common fruits and vegetables that you often see at farmer’s markets. In preparation for this book, Deborah visited farmer’s markets across the nation, and she recounts plenty of interesting stories from them making this a very pleasant book to read. Deborah’s recipes are all very simple, allowing the exceedingly fresh and flavorful produce that farmer’s markets are known for to shine through. Some recipes feature regional fare that may not be available everywhere, but most rely on ingredients common to all farmer’s markets. After reading through the chapters related to spring vegetables, I felt ready to approach my farmer’s market with new eyes. I excitedly picked up two vegetables I had never used before: sorrel and lovage. Sorrel is a leafy green with a bright, lemony flavor. It can be used raw in salads or may be cooked. Lovage is an herb that has a flavor similar to that of celery. From my new cookbook, I decided to make Risotto with Sorrel because it was so simple and therefore seemed like it would be a good showcase for the sorrel. The basic risotto is made from nothing more than butter, onion, Arborio rice, vegetable stock and lots and lots of sorrel. A few herbs and some cream are stirred in right at the end, but I actually thought it tasted great even before adding those extra ingredients. The sorrel cooks down to a deep olive-colored puree. It was amazingly buttery in texture, and I was quite surprised at how little of its signature tart flavor was lost even after cooking for nearly 45 minutes. The risotto tasted very Greek to me, like a complex spinach & dill flavored rice with lemon even though it was only made with sorrel. I served the risotto with salmon and a mix of braised spring vegetables including baby turnips, asparagus and green garlic which I seasoned with a dusting of minced lovage. It was a perfect springtime meal! Aside from the fact that a trip to the farmers market is generally a fun way to spend the morning, our main reason for going was to get our hands on some tamales from the Patty Pan Grill stand! The last time we visited the market, back in early April, we had just eaten breakfast so we weren’t in the mood to eat anything more. But, after catching a whiff of the grilled onions and veggies coming from the Patty Pan Grill stand, we made a pact to come back as soon as possible. All of the tamales at Patty Pan Grill are vegetarian, and you can order them solo or with a side of their delicious grilled vegetables. The grilled veggies – that day a mix of cabbage, kale, gai lan, and onions – are cooked on a large cast-iron griddle with ground cumin and chili powder. The aroma coming off that griddle is amazing. We ordered a tamale and a grilled vegetable quesadilla (pictured.) The tamale and quesadilla were both good, but it was the grilled veggies that really did it for me! Robert decided to pick up a 3-pack of tamales to take home and have as his Cinco de Mayo lunch the next day. We also bought a poppy seed-filled bread and a raspberry strudel from the Little Prague Bakery, a half loaf of Tall Grass Bakery’s awesome pumpernickel-dried cherry bread, a small wedge of “Tipsy Cow,” a cabernet-washed cow’s milk cheese from River Valley Ranch (which went beautifully on the pumpernickel-cherry bread) and some baby carrots and rapini which Robert used in a delicious noodle stir-fry for dinner Sunday evening. Hooray for the farmers market! One of my favorite snacks of all time is chips and salsa. This is actually true of my entire family; chips and salsa is almost always the featured appetizer at my parent’s house, regardless of whether or not we’re having Mexican food for dinner. My mom has been known to put out a bowl of chips and salsa on Thanksgiving Day or even before a big meal of Chinese takeout. And, hey what’s not to love? You’ve got crunch, you’ve got spicy, and salsa has to count as one of your daily servings of fruits and vegetables, right? Add a bowl of guacamole to the mix and I call it dinner! Over the past few years, however, Robert and I have noticed that we are finding fewer and fewer salsas that we really like. Most of them are too sweet and few of them are spicy enough for our tastes, sometimes even those that are labeled “extra hot” (we’re not masochists or anything, but a little bit of a burn would be nice.) 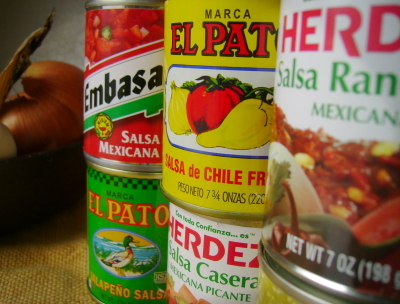 Some of the novelty salsas (e.g. black bean and corn salsa) are good every once in a while, but we have yet to find a really great everyday tomato salsa. And, when you’re facing price tags of $6 to $8 per jar, it’s tough to go out and try a bunch of different kinds in search of the perfect one. El Pato (“The Duck”) Tomato Sauce – This is actually a Mexican-style tomato sauce, not a salsa (yes, yes, I’m aware that salsa means sauce in Spanish, but you get the point.) Robert and his buddies used to use this in place of salsa back when they were on a tight budget, and then he later introduced me to it. It’s pretty good on chips, but perhaps we just feel that way for sentimental reasons. Robert also uses this as his secret ingredient in bloody marys. Embassa Salsa Verde – This one is flavorful and somewhat spicy. It is quite tart (not entirely unexpected considering that the main ingredient in salsa verde is tomatillos.) I think this would be great doctored up with a little fresh cilantro. El Herdez Salsa Ranchera – Like the El Pato, I don’t think this one is meant to be eaten as a salsa with chips. Although tomatoes are listed as the first ingredient, dried red chilies and vinegar are the dominant flavors. Robert liked it fine as a salsa, but I thought it was a little bitter due to the high amount of dried chilies. For some reason, I think this would be really good served over eggs. I picked up some purslane at the farmer’s market this weekend. Perhaps you are now saying to yourself, “what on earth is purslane?” Purslane is a succulent that is found most commonly in Mexican, Greek, and Middle Eastern cooking. It is a low-growing, creeping plant with small paddle-shaped green leaves and a thick reddish stem. It kind of looks like a jade plant but with much thinner leaves. Purslane is often used raw in salads, but it can be cooked as well. The leaves are tender and have a refreshing lemony flavor. The stems are edible too but are best when they are young and slender. For all you gardeners out there, it is worth pointing out that purslane takes very little effort to grow. If you have a sunny spot in your garden, plant some purslane, and it will practically take care of itself. But, you might just want to check and see if you already have some growing first. Purslane is listed as one of the top ten most troublesome and pervasive weeds worldwide. 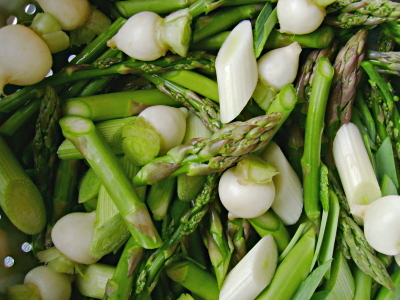 People have been pulling it out of their gardens for years without ever knowing what a wonderful vegetable it can be. Purslane is slowly starting to shed its bad reputation, however. Word is getting out that purslane is rich in vitamins and antioxidants and also contains more of the potentially heart-protecting omega 3 fatty acids than any other leafy green vegetable. My mom bought some purslane last week at her farmer’s market and used it to make Grilled Zucchini Salad with Purslane and Tomato so I decided to follow suit. I washed the purslane in several changes of water, and then I picked off the leaves and dried them in my salad spinner. Next, I grilled some zucchini and tomatoes on my little grill pan (which is producing better, more authentic-looking grill marks every time I use it!) The recipe doesn’t call for grilling the tomatoes, but I wanted to take some of the raw edge off. 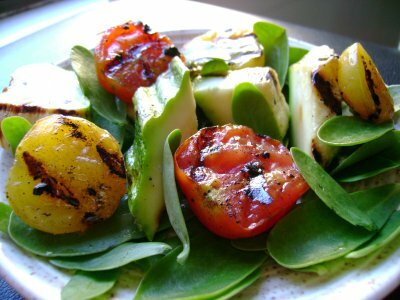 Once the grilled vegetables were cool, I tossed them together with the purslane in a lemon-shallot-parsley vinaigrette. The tart flavor of the purslane went really nicely with the smoky zucchini and sweet tomatoes. This was a really delicious change of pace from a standard lettuce salad. And, there is something mildly thrilling about eating a succulent! OK, so it may be a bit of a stretch for me to call it my new favorite ice cream since I only eat ice cream about three times a year. Whichever ice cream I am eating is pretty much my favorite at that point. Still, I am currently in love with Haagen-Dazs‘ Toasted Coconut Sesame Brittle. It is a plain cream base speckled with strands of toasted coconut and little pieces of sesame candies (Remember those caramel candies with all the sesame seeds in them that you used to eat when you were a kid before all the candy became fizzy and neon-colored? That’s what is in here.) Supposedly there is some ginger flavoring in the sesame candy, but I couldn’t detect it. It doesn’t matter, though, because there is plenty of goodness going on in this ice cream without the ginger. The coconut is so toasty and crunchy and the sesame brittle is nutty and yummy. Robert thought it was kind of weird, but I thought it was delicious. My wine of choice for this week’s winesday was a Bordeaux: 2004 Château La Rose Bellevue “Cuvée Tradition” Red. Considered by many to be the finest wines in the world, Bordeaux is also arguably the most confusing wine region to understand. Like most French wines, Bordeaux wines typically do not list the grape type on the label, instead listing only the winery name (or Château.) But, unlike, Sancerre, which you can easily remember is always made from Sauvignon Blanc, or Burgundy, which is Pinot Noir, Bordeaux wines are made from varying blends of Merlot, Cabernet Sauvignon, Cabernet Franc and others. There are some trends; certain grapes are dominant in certain areas. But, with 9000 wineries operating in 57 different appellations, how is a wine novice like me to know what style of wine I am getting when I purchase a bottle? Add in the fact that Bordeaux wines can be very, very expensive and then experimenting with these wines just seems downright risky. The good news is that there are decent and inexpensive Bourdeaux wines out there for us newbies to try. They don’t come from the best regions or most well-known wineries, but there are many cheaper wines that are good examples of the Bordeaux style. It’s just a matter of finding them, and that’s where your friendly wine merchant comes in handy. They are able to pick through the lot and find the best of the cheap wines to pass along to us. A couple of weeks ago, Robert and I stopped by our local wine shop and noticed a number of budget Bordeaux wines in stock. I picked up the Château La Rose Bellevue which is from the lesser known Premier Cotes de Blaye appellation. It was on sale for $10. There were two notes on the wine shop’s description card that intrigued me: “tastes like it should cost more” and “hints of pencil lead.” Pencil lead? Sure, sounds great! I served the wine with a simple cheese plate and some lovely vegetables from my CSA box. We had three cheeses, all from Estrella Family Creamery located in Montesano, Washington. Estrella Family Creamery began making cheese in 2003 and has been getting lots of acclaim ever since. All of their cheeses are made with raw milk from cows and goats raised on organically maintained pastures. My mom has been buying their cheeses at her local farmer’s market, and she gave us these samples to try. The “Jalapeño Buttery” is an aged cheddar cheese full of hand sliced fresh jalapeños. The jalapeño was nice and spicy! “Weebles,” a unique cheese shaped like a pear (or a weeble! ), is a provolone that has been very lightly smoked with alderwood. Finally, we had the “Guapier,” a cow’s milk cheese modeled after French Morbier with a thin line of charcoal in the middle separating the evening and morning curds. This one was my favorite! The texture was very soft, similar to Havarti, but the cheese was much more flavorful than Havarti. And, the slightly gritty charcoal added a very unusual element. I loved charred food, but I don’t think I’ve ever had charcoal in my cheese before. You can find Estrella Family Creamery cheeses at several Seattle farmer’s markets. DeLaurenti and Beecher’s also supposedly sell their cheeses, but I didn’t see them at either place when I was there the other day. The wine tasted like a good, fairly straightforward Merlot (it was 75% Merlot and 25% Cabernet Sauvignon.) I suspect that this wine was fruitier than higher quality Bordeaux but, since I haven’t had Bordeaux before, I can’t really back that up. Still, it was much less fruity than Californian or Australian wines tend to be (this is the classic distinction between old and new world wines – old world wines tend to be more earthy whereas new world wines tend to be heavy on the fruit.) The wine went very well with the Estrella cheeses. It had a nice light, fruit flavor with a small amount of tannins. I couldn’t detect the pencil lead, however. Perhaps the charcoal from the Guapier was interfering with it! Mmmmm…charcoal and pencil lead.